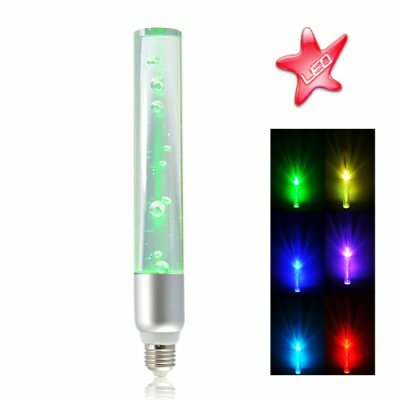 Successfully Added Bubble Lamp - Color Changing LED Light to your Shopping Cart. A long style LED lamp made of glass, composed of bubbles and color changing! Decorate your room with amazing colors! Are you tired of the depressing atmosphere reigning in your room? Each time you go home you feel bored because there is nothing more diverting than the wooden clock of your grandfather going "tick-tock"? What about enlightening your mind and apartment with bright and vivid colors? This beautiful lamp is designed in this purpose thanks to its 4 main colors (red, green, blue and white) and 12 secondary ones. According to your mood simply select the one you need or 1 of the 4 modes available (flash, strobe, fade, smooth). Operated with a remote control (up to 8 meters away) it is convenient for people used to lay down on the sofa while listening to music or watching TV. The color changes and luminosity are smooth and adjustable so it matches with preferences of everyone. What more? This item has bubbles located inside its bulb, which makes funny shapes when the light is projected on any surface! Beside the relaxing aspect this lamp is also educational. When the light goes through the bubbles it is dispersed and its spectrum appears on the wall. What a nice surprise when the white beam displays a rainbow! Thus become a teacher for your kids and explain them how a few colors create others by combining them. They will admire you even more than before! Creating a Zen environment in your living room, bar or club is as simple as ordering this great lamp right now! We will ship it out tomorrow and it will reach your place shortly! All this is brought to you at a great price by the online leader in China wholesale cool gadgets - Chinavasion.